The fuel system is made up of the fuel tank, pump, filter, and injectors or carburetor, and is responsible for delivering fuel to the engine as needed. Each component must perform flawlessly to achieve expected vehicle performance and reliability. Over time, an engine’s performance can slowly diminish because of buildup, which clogs vital parts of the fuel system and causes reduced fuel efficiency and power. 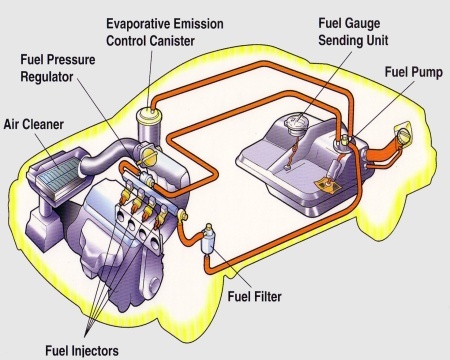 The fuel injector is the last stop for fuel in your engine before it goes inside to the combustion chamber. It is basically an electrically operated gate that opens just long enough to meter the perfect amount of fuel to run the engine. Carburetors, were the usual method of fuel delivery for most vehicles up until the late 1980s. Most carburetors were manual non-electric devices that are used for mixing vaporized fuel with air to produce a combustible or explosive mixture for internal combustion engines. Carburetors have been mostly supplanted by electronic fuel injection. The Intake valve opens to allow the air/fuel mixture to be drawn into the combustion chamber. Deposits on the intake valves can restrict or change the flow of the air/fuel mixture into the combustion chamber. Fuel can stick to deposits on the intake valve and not enter the combustion chamber when needed. The right fuel system service can help reverse these effects and restore lost performance. The piston travels up and down, and converts the pressure from combustion into movement. Detergent cleaner can help remove or reduce deposits have been shown to be effective in reducing or eliminating deposit-related drivability and performance loss. The Combustion Chamber is where burning of the air/fuel mixture happens. Deposits in the combustion chamber can affect heat transfer and air/fuel compression. Excess heat can cause premature ignition and knocking. Some vehicles contain knock sensors that are used to determine engine knock or pre- or post-detonation. With these sensors, the computer will detune the engine to eliminate this symptom, which has an adverse effect on performance. Fuel system deposits will cause knocking, which is why it is so important to keep your fuel system clean. A fuel injection service removes the unwanted buildup by cleaning your injectors, intake valves and combustion chambers. The result: increased fuel mileage, a smooth-idling engine and improved performance. 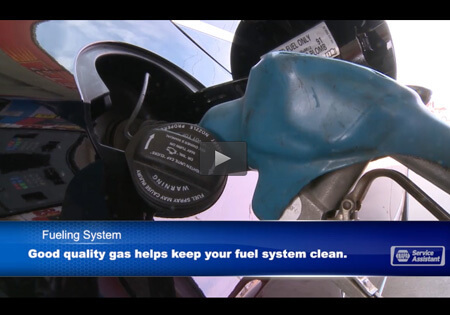 Ready to schedule a Fuel System Cleaning Service? Call or schedule online at Auto Select today. Dear Tony & Craig and all the Auto Select technicians - Your services go way beyond my expectations. I would recommend you to any one for service on their car and my car! Thank you for the best service. I was on the road to Hurley. My fuel pump went out just east of Weston. AAA towed it to the shop. You fixed it within 3 hours and I was on the road again. Thank you for the fast service! Hi Doug, Just wanted to say thanks for delivering our car to our house while I was recovering from surgery. It’s outstanding service like that, that keeps us coming back! Your efforts (and your crew) were greatly appreciated! Thanks.